It's no secret that I'm a fan of FOX's Sleepy Hollow TV show. The surprise is more that the show is far better than its premise gives it any right to be. I'd dismissed Hollow off-handedly when it first started airing, and only after several friends recommended it to me did I begrudgingly look to what I expected to be a schlock-fest with a time-traveling Icabod Crane. That's also exactly what I got, but somehow in the most entertaining way possible. I've been eagerly devouring episodes of the show since it began airing, enjoying its monster-of-the-week format and contemplating, whenever a new supernatural baddie comes on screen, how I could integrate something like it into Pathfinder. Now, when I started this blog I'd had the idea about a series of articles converting pop-culture monsters into Pathfinder monsters—ever so subtly named Pop Creature—and that's exactly what I'm going to be doing here. 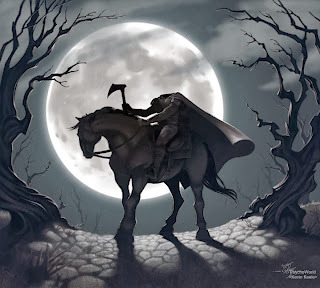 The Headless Horseman, the most iconic thing to come out of the Sleepy Hollow story in all its numerous iterations, has been converted into tabletop gaming appearances on many occasions and in more forms than there have been iterations of gaming systems. Pathfinder originally took their hand at it in the Pathfinder Adventure Path #43, The Haunting of Harrowstone. Here, the Horseman is presented as a haunt that emulates the feeling of the classic Sleepy Hollow story most of us have heard. Rite Publishing also did their take on it recently, which I haven't yet seen the mechanics of. But all of these are more based on the classic literary Sleepy Hollow than the current television show. What is presented below is an adaptation of the Sleepy Hollow TV show's interpretation of the Horseman as an avatar of the Horseman of Death of the Four Horsemen of the Apocalypse. Converting this concept to Pathfinder felt natural, as the Four Horsemen have their own presence as deific figures. While this Pathfinderized version of the Headless Horseman isn't the Horseman of Death himself, he is a soldier in his army and a servant of Charon's most powerful minions. I tried to do justice to the Horseman's implacable nature, weaknesses as presented on the show so far, while blending those elements into the Golarion setting. Below, you'll find a sample headless horseman based off of the statistics for a Hellknight NPC as detailed in the Inner Sea NPC Codex, rules for creating your own headless horseman NPCs with a new template, the statistics for a headless horseman's severed head, and a ritual used to raise unwilling victims from the dead as headless horsemen of Charon. Atop a bone white steed with smoldering, red eyes, a rider donned in the coal black plate armor of a Hellknight is poised for battle. In one hand he holds the reins of his infernal steed, and in the other a battleaxe that glows with the heat of freshly forged steel. Most strikingly, this armored rider lacks a head, having only a cauterized stump for a neck. Burning Weapons (Su) Any melee weapon wielded by the Chelaxian gains the flaming special quality. Decapitate (Ex): A creature struck by a critical hit from a slashing weapon wielded by the Chelaxian must make a Fortitude save or be decapitated and die. Creatures without a head or immune to critical hits are immune to this ability. Detect Chaos (Sp) This ability functions like a paladin's detect evil ability, save that it detects chaos. Disciplines (Ex) The Chelaxian has access to two disciplines. Fearsomeness: Twice per day, the Chelaxian can use the Intimidate skill to cause a creature within 10 feet to become frightened instead of shaken. Pentamic Faith: The Chelaxian gains all granted powers of the Law domain (but not domain spells), treating his Hellknight level as his cleric level. Force of Will (Ex) The Chelaxian gains a +2 bonus on Will saves against spells with the charm descriptor and a +4 bonus against spells with the fear descriptor. Headless (Ex) The Chelaxian's power comes from the ritual performed upon the removal of their head, which animates them as an undead creature. As long as the horseman's severed head remains intact, the Chelaxian gains blindsight, damage reduction, regeneration and the infernal mount abilities as detailed under their respective entries. Should the Chelaxian's head be destroyed, he loses these abilities and is staggered. The Chelaxian cannot benefit from potions, helmets, or other objects that require the use of a head. Hellknight armor (Ex) The Chelaxian wears a special type of masterwork full plate called Hellknight plate armor. While wearing this armor, he reduces the armor check penalty by 2, increases the maximum Dexterity bonus allowed by 2, and moves at full speed. Rejuvenation (Su) When the Chelaxian is destroyed, its severed head immediately begins to rebuild the horseman's body nearby. This process takes 1d10 days—if the body is destroyed before that time passes, the head merely starts the process anew. After this time passes, the Chelaxian wakes fully healed (albeit without any gear it left behind on its old body), usually with a burning need for revenge against those who previously destroyed it. Smite Chaos (Su) This functions as the paladin's smite evil ability, but against chaotic-aligned creatures. This ability is twice as effective against outsiders with the chaotic subtype, chaotic-aligned aberrations, and fey. Soldiers in Charon's army, headless horsemen are terrifying shock-troops of the Horsemen of the Apocalypse. These implacable foes fight relentlessly in the pursuit of death and destruction, leaving a trail of beheaded bodies in their wake. Headless horsemen are servants of the most powerful of Charon's faithful, enacting the will of the Horseman of Death across the planes. “Headless horseman” is an acquired template that can be added to any living creature (referred to hereafter as the base creature) that possesses a head. A headless horseman retains all the base creature's statistics and special abilities except as noted here. Type The creature's type changes to undead. Do not recalculate BAB, saves or skills. Senses A headless horseman gains blindsight 200 ft.
Hit Dice Change all of the creature's racial Hit Dice to d8s. All Hit Dice derived from class levels remain unchanged. As undead, headless horsemen use their Charisma modifiers to determine bonus hit points (instead of Constitution). Special Attacks A headless horseman gains the special attacks described below. Save DCs are equal to 10 + 1/2 horseman's HD + horseman's Cha modifier unless otherwise noted. Burning Weapons (Su) Any melee weapon wielded by a headless horseman gains the flaming quality. Decapitate (Ex) A creature struck by a critical hit from a slashing weapon wielded by a headless horseman must make a Fortitude save or be decapitated and die. Creatures without a head or immune to critical hits are immune to this ability. Defensive Abilities A headless horseman gains channel resistance +6, DR 10/epic, and regeneration 15 good and silver. The headless horseman also gains the following defensive ability. Rejuvenation (Su) When a headless horseman is destroyed, its severed head immediately begins to rebuild the horseman's body nearby. This process takes 1d10 days—if the body is destroyed before that time passes, the head merely starts the process anew. After this time passes, the horseman wake fully healed (albeit without any gear it left behind on its old body), usually with a burning need for revenge against those who previously destroyed it. Attacks A headless horseman gains a slam attack if the base creature didn't have one. Damage for the slam depends on the horseman's size. Spell-like abilities (Sp) A headless horseman is surrounded by a constant death knell aura. Sunlight Powerlessness: If the headless horseman is in sunlight (but not in an area of daylight or similar spells), it cannot attack and is staggered. Headless: A headless horseman's power comes from the ritual performed upon the removal of their head, which animates them as an undead creature. As long as the horseman's severed head remains intact, a headless horseman gains blindsight, damage reduction, regeneration and the infernal mount abilities as detailed under their respective entries. Should the headless horseman's head be destroyed, he loses these abilities and is staggered. A headless horseman cannot benefit from potions, helmets, or any other item that requires the use of a head. Special Abilities A headless horseman gains the two special abilities described below. Save DCs are equal to 10 + 1/2 horseman's HD + horseman's Cha modifier unless otherwise noted. Infernal Mount (Su) Once per day a headless horseman may, as a full-round action, imbue an animal (of up to 2 HD per HD of the headless horseman) with supernatural abilities with a touch. The animal may attempt to resist this ability with a successful Will save. On successful use of the ability, the animal is treated as friendly to the headless horseman and is inexorably bonded to them until the mount's death or the destruction of the horseman's severed head. A headless horseman's infernal mount gains the fiendish simple template, a +10 bonus to its land speed, and shares the horseman's damage reduction and regeneration ability. An infernal mount always knows the exact direction and distance to its master as long as they are on the same plane. If this ability is used on another creature's animal companion, such as a paladin's bonded mount, and the creature fails its Will save the horseman effectively severs the bond between the animal companion and its master. The animal immediately loses all animal companion modifiers and gains the traits granted by the horseman's infernal mount ability. If the headless horseman is eligible for an animal companion or bonded mount by way of class abilities or other means, and his infernal mount qualifies to become one, he may immediately assume the infernal mount as his companion upon successful use of this ability. Abilities Str +8, Dex +2. Being undead, a headless horseman has no Constitution score. Skills Headless horsemen gain a +8 racial bonus on Intimidate, Perception, and Ride checks and Ride is always considered a class skill for a headless horseman. Feats Headless horsemen gain Mounted Combat and Ride-By Attack as bonus feats. The ritual to animate a headless horseman traps the horseman's life-force within his severed head, much as a lich's soul is bound to his phylactery. The severed head is immune to damage from non-mythic sources and has a hardness of 30 and 150 hit points. A horseman's head is a source of critical weakness to a headless horseman. If held by a creature that can channel negative energy the horseman may not target the bearer of the head with direct attacks (though they may indirectly damage them such as with area-of-effect spells or effects.) Additionally, the bearer of the head may issue commands to the horseman as if they controlled them via command undead. Mythic break enchantment can be used to destroy a horseman's skull if it is cast while the skull is contained within a magic circle against evil and the spellcaster is able to beat the skull's caster-level with the required caster-level check. A mythic spellcaster of at least 16th level who worships Charon, the horseman of death, may create a headless horseman. The ritual to do so requires a living creature who must be present for the entire ritual, but need not be a willing participant, that is beheaded at the ritual's conclusion. The ritual requires 1 hour per HD of the creature to be transformed and special reagents costing 4,000 gp per HD of the horseman to be created. At the end of the ritual, an unwilling participant must make a Will save (DC 10 + 1/2 spellcaster's HD + spellcaster's primary casting stat modifier.) If the victim of the ritual passes their save the beaheading kills them but they do not rise as a headless horseman. However, a creature slain by this ritual may only be raised from the dead by a true resurrection, miracle, wish. Once created, a headless horseman has free will and is not under the control of its creator, unless they remain in possession of the horseman's severed head. Most horsemen resent this measure of control and plot to free themselves from their enslavement to pursue their own goals.